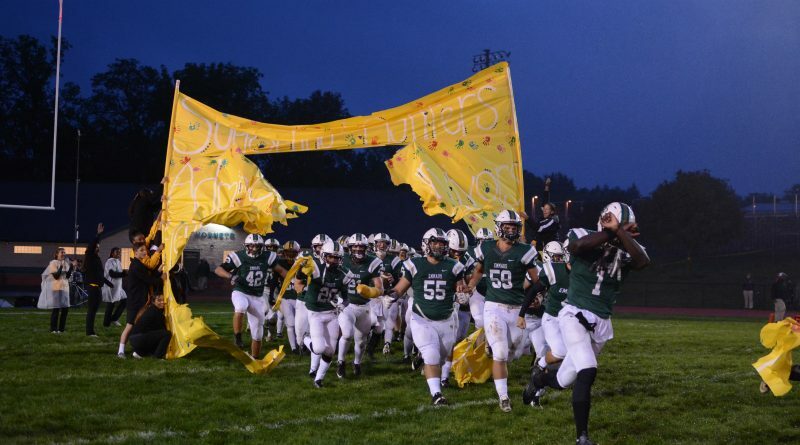 After a long and hard-fought season, Emmaus football fell to Freedom in their final game, ending their quest to capture the District XI championship, but the Hornets finished holding on to the EPC South title. Throughout the season, the players faced difficult opponents including Emmaus’ rival, Parkland. The face-off for the East Penn Conference league title rested on the outcome of the game against the Trojans. Decades of rivalry and competition between the schools led to a crowd of over 8,000 in the East Penn School District Stadium on Friday, Oct. 28. Always one of the toughest competitions for the Hornets this one was going to be a dogfight. Junior linebacker Nate Hannis felt confident in the team’s performance before the Parkland game. This marked the first season under head coach Harold Fairclough, who made it a priority to push the players. “[The team needed] an overall sense of urgency to get things done the right way,” Fairclough told The Stinger last month. Jake Hildebrand, one of the assistant coaches, watched the team develop since they began working in the weight room for most of the year. During the game, starting quarterback Derek Sheaffer’s ankle injury resulted in junior Blake Reed playing the entire second half. Reed stepped up and helped bring the team to earn its victory. The game tied at 21-21 with a throw from Reed to senior wide receiver Drew Schwindenhammer, scoring a touchdown. Then a field goal kick from Carson Landis gave Emmaus a three-point lead. Parkland’s Jahan Worth was stopped at the one-yard line by Jared Skibinski granting Emmaus outright league champions and setting the home side of the stadium off celebrating. The Hornets and Trojans finished the game 24-21 after double overtime. Emmaus now reigns as the EPC South champ, holding any title since 1981. The team’s winning streak came to an end two weeks later against Freedom with a score of 42-12. Feature photo by Rachel Reed.